" For your consideration is this vintage early-1965 Fender Stratocaster electric guitar. This particular example, serial number L88269, is in nice original condition. This pre-CBS early-'65 example is early enough to feature; a small headstock profile with the transitional Fender logo decal, a (perfectly intact) green pickguard, an L-prefix serial number, gray-bobbin pickups, pearloid dot fingerboard inlays, cloth-wiring, etc. This exceptionally fine player's example is not necessarily in the finest collector's condition, however, it is a very nice completely intact original specimen, and displays years of authentic playing wear. 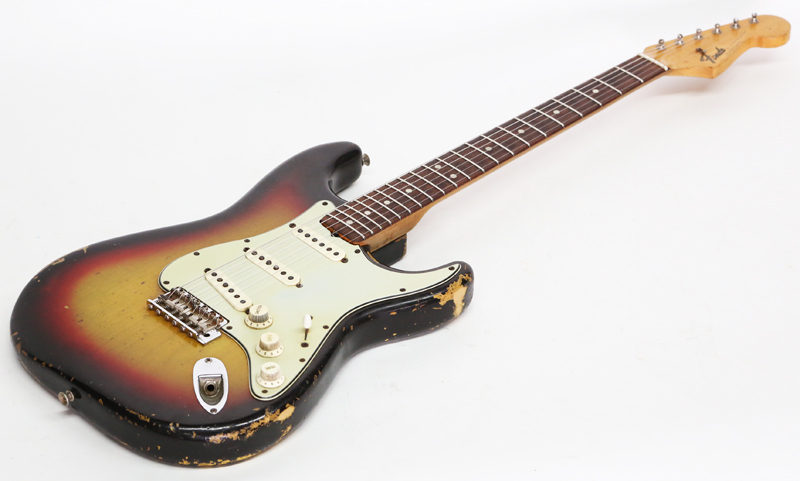 Aside from the refret and changed nut, this Strat is otherwise in 100% all original condition. 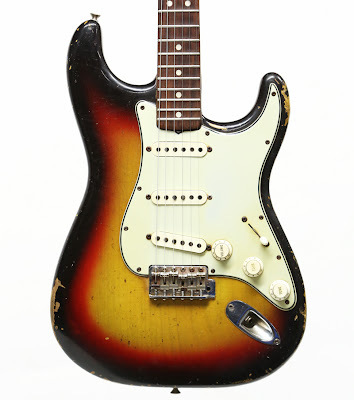 So take advantage of this opportunity to buy an absolutely perfect player's Strat without having to spend money to devalue one with original small frets, just to be able to actually play it, and get this pre-CBS green guard example for a little more than the price of a new Master Built reissue. As illustrated in the photos to the right, the original 3-tone sunburst nitrocellulose lacquer finish displays mild playing wear on the front, and significant belt buckle rash on the back which reveals the natural grain of the yellow Fullerplast-treated Alder body. Both the neck and the body feature original nitro finish, though the clear lacquer on the back of the neck has been naturally rubbed off from years of playing. All of the plastic parts are original and in excellent condition, though the toggle switch tip displays an old crack in the side. The mint green pickguard is in perfect structural condition, with no cracks and very insignificant shrinkage. The Strat appears to have been professionally refretted several years ago. In the process, the luthier sanded the top of the fingerboard to remove the serious playing divots, in the first several positions, and though some of the board was planed, there is still a substantial amount of meat left. Please reference the side profile photo of the 12th fret to verify. The hardware is in nice condition, and the original double-line Kluson Deluxe tuning machines are in perfect functional shape. The oriignal bridge is in comparably nice condition, though the pickguard screws display serious rust. The guitar plays incredibly easily: the slim taper profile neck is extremely comfortable, the jumbo frets make string-bending a breeze, and it is utterly effortless to play. The bridge is setup for low tension, and excellent intonation. And though not pictured, the original tremolo arm is included..."